Howdy folks! It's Joe again and we're here for our last Legacy article of 2018! Woohoo! It's been a crazy year, so we're gonna wrap up this year's Legacy look with a deck that's mostly Red/Green, just in time for the Holidays! Of course, this deck ain't no Tinsel Town, but is is full of tentacles that wrap around things. I'm speaking of course, about Red/Green Lands! R/G Lands' early history comes from the printing of the card Life from the Loam in Ravnica: City of Guilds. Right off the bat players were trying to abuse the power of this awesome card advantage spell, and in Legacy the "Lands" archetype began. Originally, Lands was primarily a RUG (Red/Blue/Green or Temur as the cool kids are calling it these days) based deck that focused on attritioning its opponents out of the game with the Loam engine and then using cards like Academy Ruins to recur Engineered Explosives or Mindslaver. Additionally, it furthers use of Punishing Fire / Grove of the Burnwillows and damage lands like Barbarian Ring to get the job done. Then in July 2013, everything for this deck changed. The legendary rule was changed again, allowing multiple players to control legendary permanents with the same name, and also giving players the choice of which to keep if the controlled more than one legendary permanent. This change opened up a new avenue based on the interaction between Thespian's Stage and Dark Depths, giving the deck a much faster combo kill that was more difficult to interact with, not to mention much easier to continually recur. Thus, R/G Lands was effectively born. Since then the deck has undergone much development thanks to its fervent pilots, most of whom are well known in the Professional Magic community in folks like Jarvis Yu, Jody Keith, and David Long. Let's be up front about one big thing: R/G Lands is one of the more expensive decks in Legacy format outside of Blue decks that run Underground Sea in multiples. 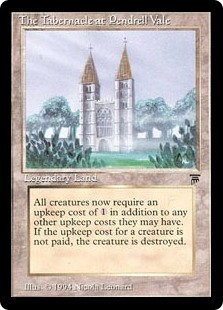 The reason this deck is so expensive is nearly mostly on the back of a single card: The Tabernacle at Pendrell Vale. Possibly the most important card to this archetype, it is pretty much impossible to play this deck and expect to do well without one. There is basically zero land-based equivalent to what this card does, and it remains one of the biggest Reserved List price blocks to playing this deck (thankfully, this deck is only approximately 300 tix on Magic Online so there is that). The other roadblock to this deck are the rest of the very expensive cards such as Mox Diamond, dual lands in the form of Taiga, and things like Karakas, Wasteland, and Rishadan Port. Of course, if the play style intrigues you, you're most likely on this deck for life (or until you decide to sell your Tabernacle). With that being said, let's take a look at a list, shall we? Despite the relative expense of the deck, R/G Lands is a powerful option with mana denial, creature control, and a 20/20 combo finish that often ends the game on the spot. The core construction of R/G Lands depends on several cards that make this deck function. These cards are the most important pieces of this deck, as they allow for this archetype to exist. The most significant nonland cards in the deck, these allows Lands to exist. Life from the Loam is a powerful card advantage engine, especially when combined with cycling lands like Tranquil Thicket and Sheltered Thicket. Exploration gets the deck ahead on mana over its opponent and sets up combo kills earlier, while cards like Crop Rotation and Gamble tutor for whatever answer the deck may need at the moment. And finally, Manabond is great for delivering fast kills and abusing Life from the Loam. Mox Diamond turns any land into a mana source and synergizes well with Life from the Loam, while the manabase also gets to play cards like Grove of the Burnwillows and the customary suite of fetch lands and duals. In addition nearly every list plays one basic Forest because of cards like Blood Moon, Wasteland, and Back to Basics. One of the only other non-land cards in this deck is Punishing Fire as it combos with Grove of the Burnwillows in order to provide a repeatable source of creature control as well as burn. The rest of the Lands in this deck are often treated as spells, because in a sense they are. Cards like Wasteland and Ghost Quarter destroy lands, while Rishadan Port keeps lands under wraps on opponent's turn. Maze of Ith, Glacial Chasm, and The Tabernacle at Pendrell Vale keep creature board states under control. The combo plan of this deck is very simple to execute: Activate Thespian's Stage targeting Dark Depths. The activation resolves and now you have two copies of Dark Depths in play, so the game prompts you as to which one you would like to keep. The copied Depths has no ice counters on it, so you choose to keep it. Next the Dark Depths trigger goes on the stack, prompting you to sacrifice the land in order to receive a Marit Lage 20/20 Flying, Indestructible Legendary Creature. Fairly simple thing to do in practice. For those following along however, you can see the breaking point rather easily. In order for the "state" trigger that is looking for a Dark Depths with zero ice counters on it to resolve, you have to sacrifice the land. If you can't sacrifice the land, you won't get a 20/20. This can often be very important as this is the most critical and best junction to Wasteland versus this deck because then it costs the Lands player both their Stage and their Depths. Also, never try to Stifle the Depths trigger. Bad idea all around, since the trigger will just go right back on the stack since it is a "state trigger". Additional interaction for this deck exists in the form of silver bullet cards like Karakas, Bojuka Bog, and Horizon Canopy, and the cycling lands like Tranquil Thicket and Sheltered Thicket. The lands that draw cards are great at allowing you to Dredge on your opponent's turns if need be. Lands has had an ever-evolving sideboard as new cards are printed presenting new options. It's not uncommon these days to see cards like Ancient Tomb in Lands sideboards, as it acts as an accelerant for the combo as well as most of Lands' hate cards. Anti-hate such as Ancient Grudge and Krosan Grip are often present to deal with Pithing Needle and Blood Moon type effects that hate on non-basic lands. Lands often runs its own fair share of hate, because it often must. The nature of the deck lends itself to poor matchups vs spell-based combo decks (such as Storm), requiring cards like Chalice of the Void, Sphere of Resistance/Thorn of Amethyst, and even Choke to push through certain matchups. Other cards that fit this category are things like Drop of Honey, Kozilek's Return (for dealing with pesky creatures), and occasionally even extra copies of cards like The Tabernacle at Pendrell Vale or silver bullet lands that don't fit in the main 60 cards. A relatively new addition to the Lands family, being one of the only creatures in a deck that has no creatures in its main, Tireless Tracker is excellent in matchups where your opponent is cutting removal for things like graveyard hate and nonbasic land hate. Tracker lets you push through and beyond letting you draw cards to find anti-hate options, it also grows to enormous sizes when not dealt with, making a powerful and awesome addition to the R/G Lands team. R/G Lands and Matchups: How Does it Fare? Lands is a difficult deck to pilot well but occasionally you do get rewarded for having very nutty hands. That being said, the deck does have its predators. Metagame predator Death and Taxes (which we talked about last month) can occasionally be bad for Lands, depending on the skill level of the DnT pilot and the DnT player's sideboard options. It is an opposing Rishadan Port and Wasteland deck, and that should be taken into account while playing against it. On the other hand, decks like Burn can issue a quick victory, thanks to Price of Progress being able to just kill a Lands pilot out of nowhere. As mentioned, spell-based combos decks such as ANT/TES are very unfavorable matchups thanks to how fast these decks can be over Lands. In addition, decks like Sneak and Show can overwhelm a Lands player quickly with the combination of Emrakul, the Aeons Torn and Griselbrand. Miracles and Grixis Control can be "okay" matchups as long as the Lands pilot is able to play around certain cards Game 1 (For example: If the Miracles pilot is playing Main deck Back to Basics) and is able to gain traction, however sometimes these decks can establish dominance over Lands as well with removal like Terminus or Diabolic Edict. Post-sideboard however, decks like these gain lots of options like Surgical Extraction (paired with Snapcaster Mage that can easily pin down a Lands player. Against most of the rest of the field, combo decks like Dredge and Reanimator can be fairly easy thanks to typically main deck Bojuka Bog and Crop Rotation. This deck is still very powerful but it has caused several branch-offs into the Dark Depths category, such as Turbo-Depths which aim to do the Depths/Stage combo but much faster and without the control aspect as Lands has. You should play this deck if you enjoy controlling the board state and slamming your opponent with a 20/20 indestructible creature, but be aware of the price tag up front before making this decision. Play test with friends before deciding on this deck. That's all the time we have this month folks, and all the time we have for 2018! It's been a crazy year and I hope you all have some killer Holiday season coming up! We'll catch you kids on the flip side of 2019, and we're gonna start the year off right with a mail bag! That's right, I wanna get your questions and I wanna answer them. So, you can submit your questions two ways: either @ me on Twitter or you can hit me up on Discord in the Cardsphere Discord Server. I'm going to give you guys until December 19th to get me some questions, be it about Magic in general or about the Legacy format. So hit me up and let's kick 2019 off right! Darrin Keener brings us through getting the most out of your Experimental Frenzy with some interesting tech you may have overlooked.